Construction Management is a professional management practice consisting of the application of numerous services to construction projects and programs from the planning phase, the design phase, the construction phase and the post construction phase. Each phase represents a necessary component for achieving project objectives including the management of scope, quality, time, and cost. Owners rarely have the staff resources necessary to focus on every detail of construction projects. The lack of attention to complex details of a construction project can become very costly for an owner. As a construction management firm KWAME provides professional, effective construction management services from concept to completion. KWAME becomes the eyes and ears of the owner throughout the project; establishes reporting systems; manages system controls; evaluates subcontractor productivity; and conducts regular on-site progress meetings. KWAME possesses expertise in construction management within three distinct segments: owner’s representative, agency construction management, and at-risk construction management. As Owner’s Representative, KWAME augments our client’s staff with construction management expertise during the pre-construction and construction phase aspects of projects, which can include acquisition, planning, site preparation, design and construction. KWAME’s construction managers, engineers, architects, accountants, schedulers and cost estimators extend our client’s staff with expertise in the on-time and on budget delivery of high quality capital and infrastructure improvement projects. Agency Construction Management is a fee-based professional service that can be applied to any delivery method. As the Owner’s principal agent, KWAME is responsible for providing unbiased, objective advice on crucial matters such as funding, scope of work, scheduling, design and construction oversight, quality control, contracting and procurement. 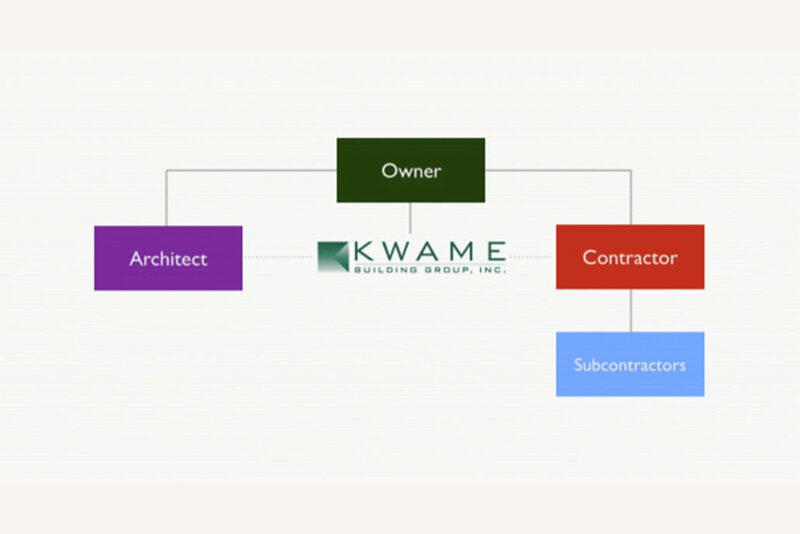 KWAME serves as a third-party manager in the design and construction process – managing the architect’s timely delivery of biddable and constructible documents that illustrate the Owner’s program and vision. KWAME works toward ensuring construction of the owner’s vision is completed in a cost effective and efficient manner that is in compliance with all contract documents. KWAME implements an open book, transparent approach, ensuring that our client is making informed decision regarding project cost, schedule and aesthetics. On At-Risk Construction projects, KWAME maintains a strict consulting position to the Owner during the pre-construction phase of a project- while providing technical services in order to help establish the scope, cost, schedule and other key project variables. Upon transition to the construction phase of the project, KWAME commits to a Guaranteed Maximum Price (GMP), allowing the Owner to benefit from KWAME’s knowledge of the pre­-construction phase, project management and scheduling, and site supervision expertise, while having the security of a fixed price and schedule. While there are various forms of At-Risk engagements, our goal is to fully understand the critical concerns and risk tolerance of our client and work to structure a team that meets the needs of all stakeholders.